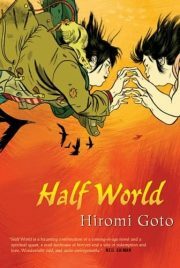 In Hiromi Goto’s 2009 novel Half World, the world is divided between the Realm of Flesh, the Realm of Spirit, and a Half World that bridges them. In ages past, humans cycled through these worlds; people lived and died in the Realm of Flesh and they were reborn in the Half World, where they were purged of their sins and traumas. Once purged, they were reborn in the paradisiacal Spirit World, from which they will fall, to be reborn in the Realm of Flesh. So the cycle began again. It’s basic Buddhist cosmogony at work. But somehow, nobody is quite sure how, this cycle was shattered. The inhabitants of each realm have been trapped in their realms, reborn over and over into the same circumstances. This is hardest on the Half Worlders, who must relive their traumas over and over. The worlds are stuck in stasis.